Boss Richard Cockerill says Leicester Tigers' fightback to beat Gloucester and boost their play-off hopes was one of the finest he has seen during his 22-year involvement with the club. Tigers overturned a 17-point deficit and produced a stubborn late defensive effort to win 35-30 and go fourth. "The old Leicester dog, cussedness that people expect - we saw that," Cockerill told BBC Radio Leicester. "That is as good as I've been involved in, and I've been here a long time." Telusa Veainu and England centre Manu Tuilagi both crossed in the opening 11 minutes to give Tigers an early lead at Welford Road on Saturday, but three Gloucester tries in nine minutes helped put the visitors 27-13 up at the break. Tuilagi added his second soon after half-time before Peter Betham and Niki Goneva completed a dramatic comeback in a game defined by a brand of exhilarating, open attacking rugby from both sides. The bonus-point victory moves Tigers back to fourth in the table and four points above Northampton, who lost to Wasps on Sunday - a result that sets up a decisive meeting at Franklin's Gardens when Saints host Tigers on 16 April. For Cockerill the win highlighted the good, bad and ugly parts of Leicester's game. The end result, he insists, makes for good motivational tools to use ahead of Sunday's European Champions Cup quarter-final home game against Stade Francais and their remaining Premiership matches. "It's a great result," said Cockerill. "It's great to get back and win, it's a great five points and keeps us right in the mix and all those things - but that 20 minutes before the break is not good enough. "If we have ambitions of winning the competition or going further in Europe next weekend, there are parts of that we just can't accept. "It's a great opportunity to sort it because we got the win. There is a lot of stick there that you can belt them with, because we made mistakes, and there is a lot of carrot because there were so many really good things as well." Leicester, the two-time European and 10-time English champions, have not made it to the semi-final in Continental competition since losing the Heineken Cup final in 2009. In the meantime, however, they have continued their astonishing domestic form and are attempting to reach the play-offs for 12th successive season. 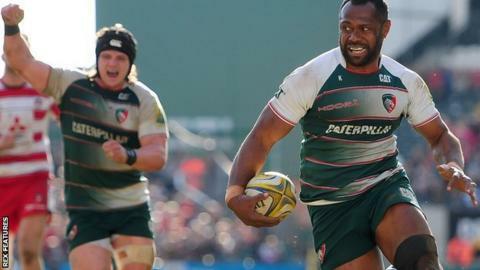 Leicester are seeded second for the knock-out stage in Europe, with a win at Welford Road this weekend enough to earn a home semi-final. "These are the games you want to be in - this is stress, this is fun," said Cockerill. "This week will be great, it will be tense, and we will be twitchy at training."